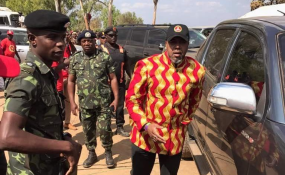 Vice President Saulos Chilima with his security. Three independent presidential pretenders in the upcoming Tripartite election have obtained their nomination papers, Malawi Electoral Commisson (MEC) has confirmed. MEC spokesman Sangwani Mwafulirwa confirmed that the independents who have collected the nomination papers are little known Henry Mbewe, Smart Swira and Baxter Boyd Natulu. US based aerospace engineer and space scientist, Dr Cedrick Ngalande who earlier told Nyasa Times he will run for presidency as an independent candidate has not collected his nomination papers and said he is not contesting. Ngalande confirmed to Nyasa Times that he has deferred his interest to run for presidency. The process of collecting nomination papers started on January 3. MEC spokesman clarified that collecting nomination papers does not make one a candidate, saying "they need to fill it and submit to the nomination between February 4 and 8." Meanwhile, apart from the three independent candidate, the leader of newly-formed tiny Mbakuwaku Movement for Development (MMD), Peter Kuwani, has also obtained his paper and become the first to pay his nomination fees of K2 million. Kuwani showed Nyasa Times a deposit slip that he deposited the money into MEC's commercial bank account in Blantyre on Saturday. President Peter Mutharika, who is seeking a second and mandatory final five year term on ruling Democratic Progressive Party (DPP) banner, has collected his papers. Fellow presidential candidates from opposition Malawi Congress Party (MCP) torch bearer Lazarus Chakwera, UTP president Saulos Chilima (State Vice-President) and former president Joyce Banda of People's Party (PP) have also collected their nomination papers. Yet to collect his papers is United Democratic Front (UDF) President Atupele Muluzi, who is also Minister of Health in Mutharika's cabinet. According to MEC, the window of collecting the papers remains open until next month. Presidential election hopefuls must secure the support of electorate in each district in their nomination forms.